Marlin 1.1.8 - Works on the FT-5! Hey everyone, just wanted to make a quick note that after several days of testing, I can confirm that the FT-5 (R1) works just fine on the Marlin 1.1.8 firmware, the latest version available, which was released on Dec 31, 2017. I couldn't find any other discussions about firmware updates beyond the factory image on the forum here, so I thought it was worth mentioning my working setup in case anyone else was considering an update. ... and the Configuration.h file has the machine name manually set to "FT-5 Marlin 1.1.2", so that is what will display on the LCD. But the Version.h file inside the archive identifies it as the 1.1.3 codebase. So I suspect there was a partial copy/paste upgrade from 1.1.2 to 1.1.3 at Folgertech at some point. There were a ton of changes and bug fixes between the 1.1.3 and 1.1.8 versions. I gather that there was a planned "feature freeze" at one point for the 1.1.x branch in favor of improving the upcoming 2.0.x branch, but it looks like the 1.1.x floodgates opened again for Marlin 1.1.7 when 2.0.x wasn't yet ready. For me, the fact that the menu on the LCD can now scroll long filenames when printing from SD cards makes it worth the upgrade for that feature alone. There are a considerable number of differences between the Configuration.h files from the FT-5 1.1.3 Marlin and the generic 1.1.8 Marlin. I wouldn't recommend using your old file since so much has changed, and I certainly wouldn't try running the unmodified 1.1.8, as the endstop logic and other mechanical/electrical parameters are not correct. What I did, which worked well, was to open up both the old and new files in a graphical diff/compare utility and manually edit the new file to capture the FT-5 specific configuration options which were applicable, editing them as necessary when the formatting or layout changed... ie, looking at what the changes meant to a section, not just a line-by-line diff since they didn't always correspond due to the changes. So yes... it works. I thought I had a PID auto-tuning issue at one point, but it's been holding temps pretty well with the values the auto-tune gave me. So no complaints, seems to work just fine. Scrolling long file names...YES! I need this in my life. I've been wondering about updating to a newer version of Marlin. I likely have a late 2016 variant - so it is likely quite outdated. Could you explain more what you mean by how you opened up both files in a graphical diff/compare utility? What program/utility did you use? Is it just in Configuration.h, or were there other places where you needed to go through and update? Flashing, is as simple as compiling and loading the firmware as always correct? 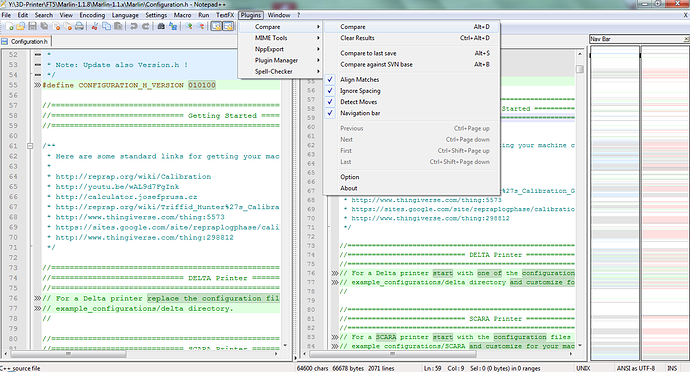 An easy way to this compare is using Notepad++ (free). and the compare plugin. Yes @dvdsnyd, it's a life changer, especially when pre-loading a SD card with multiple parts of the same project where the names are prefixed. I used BeyondCompare, but it's exactly as @Walter described. There are quite a number of different diff utilities you could use that all do approximately the same job. As I mentioned, the one catch is that enough has changed between the versions, that the lines the diff utility matches left-to-right aren't always the whole story, so you have to make sure you keep the larger context in mind. For example, I believe there was one place where a variable had a hardcoded numerical value in the old config, but used a reference to another variable in the new config. If you hardcoded it in to match the old version, there is another place in the config that used the reference that would not function properly. .. and remove the slashes to uncomment it. And yep, you're correct, flashing it to the board is just the same as always. Would you be able to post your 1.1.8 config file by chance? I'm going through my current one, but it might be helpful to have a good solid base to start from too. After a couple nights of pouring over the config files, I was able to get 1.1.8 flashed and successfully printing. 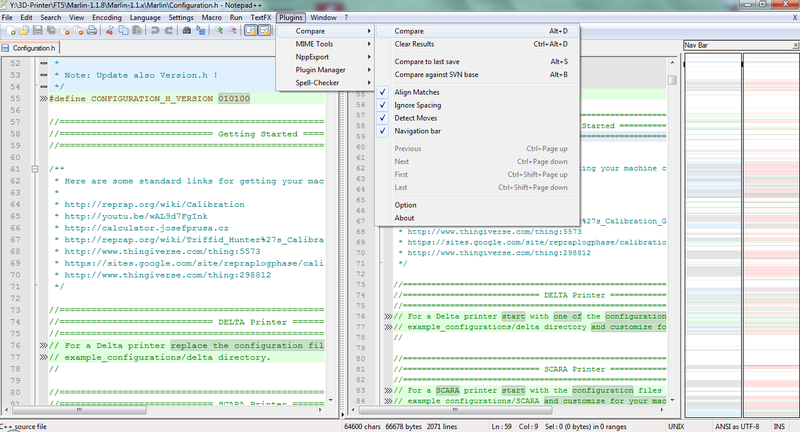 Thanks to those that pointed out the compare features in NP++ This came in handy. Ultimately, I ended up having to go line by line and manually compare the two files mostly because I think I had such an outdated version of marlin, the two files were pretty different. Overall, the transition went pretty smooth. I only ended up having one compile sanity check flag thrown. There are a couple weird things that are done in the stock firmware config file that I questioned. One of them was that the stock file had z probing enabled. Once I disabled that, the homing sequence was what I expected. Before, there was an extra 10mm offset added for a fixed probe. Overall, the menu and controls on the LCD(Stock) are nicer. The long file name scroll is nice as well. Just thought I'd post my success story here as well for others. I'd be happy to post my config file if it would still be useful. Mine is somewhat tailored, as I have different pulleys on the Z-axis, and set the thermal ranges and safeguards to more conservative limits since I'm printing exclusively in PLA at the moment. I also did some sanity changes, such as adding a bit more of a Z-axis drop during homing so that a FT-5 with the "official" part cooling fan would clear a mirror tile print surface attached with the default FolgerTech provided binder clips. I would imagine that at least this last item is a somewhat common need. If we wanted to collaborate on an "official" 1.1.8 configuration with broader support, it wouldn't be that large of an undertaking. Not sure if there is a need. From the Marlin team's perspective, I really have no idea why the long filename scrolling isn't enabled by default... It seems like a no-brainer good thing to have. Either way, glad it worked out for you! Let me know if you hit any issues, and I'll post the same back in this thread if I hit any snags. So far it's been working well for me. Just finished another 4 1/2 hour print yesterday. Nice job on the long print. I don't think I've printed longer than 3 hours on mine so far. I wouldn't mind seeing your config file if you don't mind, as I had a few questions about some of the things. The homing and offsets throw me for a loop. I currently don't have any probing, but the stock firmware had probing enabled. I'm not sure than an "official" release is needed. I would think that Folgertech would keep this updated? Maybe @csorrows can comment on that? Can you guys elaborate more? What were things you noticed? Yea, no clue. I have nothing to do with firmware. If it works why fix it I'm sure is the reason there is not a newer official version. @djcdude95, being tech support, might have a bit more push in this area. We will see if he sees me tag him again and will chime in. If it ain't broke, don't fix it. Prusas are all still on v1.0,works fine. Updating is on the table, just not a big priority. No sense in constantly updating firmwares and opening up possible bugs and incompatibilities. Users are more than welcome to mod and upload new code themselves as well. If it ain't broke, don't fix it. Prusas are all still on v1.0,works fine. Updating is on the table, just not a big priority. No sense in constantly updating firmwares and opening up possible bugs and incompatibilities. It's your call to make, but "If it ain't broke, don't fix it" can be a risky approach for anything involving software. It's that philosophy that caught so many corporations, equipment makers, users, and industrial machine operators off-guard when Y2K happened, Windows XP support ended, etc. If you chain yourself to the past, instead of rolling with easily manageable incremental changes, any update thereafter instead becomes a major (and high-risk) step-change. And you can't deflect any blame upstream at that point - you become responsible for anything and everything that goes wrong with the outdated software. I've seen it in the corporate world - it's a huge headache for those providing user/customer support when that happens (or becomes necessary). For temps, did you perform a PID auto-tune? For positions... what sort of problems are you having? yes PID auto-tune is active. Now the problem of the temp seems to be solve!!. the position is now ok (by commenting #define USE_XMAX_PLUG and #define USE_YMAX_PLUG, uncommented by mistake). The problem remaining is the way of move X and Y when I use arrows of pronterface (ie). The default occures already in previous config. This seems to have no effet during print (previous config). Now I must print in order to see if all is ok.
do you have a particular advice in using marlin 1.1.8 with ft5-r2 ? 2) If your axis configuration is correct, or reversed. Ok point 2 : the print is Ok, letter are in the good way. point 3 : I dont know vanilla 1.1.8. is It seems to me to compare with an other folgertech printer as a good idea. Today the printer works fine. You just need to reverse the X and Y directions in cura and pronterface. If you know how to do this, then that's great. I don't use either one so I won't be much help if you don't.